EU Referendum: Is this for real? After the first flutter of excitement that big changes are coming in France, no matter who wins the presidential election this Sunday (and please remember that the President of France is also a member of the real UK government) things have settled down a bit. Maybe there will be no changes after all. Not so, says Moscow Times. There will be changes for Russia. Judging by the noises that the two candidates have been making they do not seem to share President Chirac’s (or, for that matter, Chancellor Schröder’s) unbounded affection for President Putin. When I think that those who disapprove of my visit with Bush are the same ones who would shake hands with Putin, it makes me quietly laugh. Reminds of Hercule Poirot talking of things giving him furiously to think. Ségolène Royal seems to have been reminded of two things. One is that foreign policy is, in the French constitution, rests with the President. Therefore it would be a good idea if she had some policies on foreign and security matters. So far she has limited herself to telling the world and the French electorate that she wanted to see a strong France within a strong Europe and European defence integration is a good idea. The other point is human rights. After her unfortunate comment about the Chinese legal system being superior to the French one in speed, she has tried quite hard to promote herself as someone to whom human rights matter. 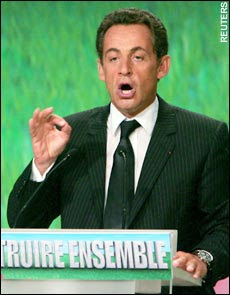 During her debate with Sarkozy she has called for the boycott of the Olympics in China unless that country drops its opposition to international action in Darfur. Hmm, not quite there yet. She was on stronger ground when she praised Anna Politkovskaya and talked of her assassination. Again, not too good for the Russian government. 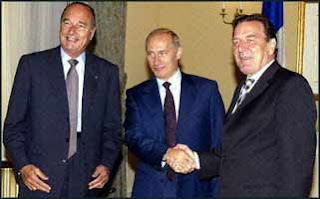 The way Moscow Times presents it, Chirac was the greatest impediment to European integration, particularly when it came to defence matters and this suited Russia very well, as Putin and others prefer to deal with European countries separately, in order to play them off against each other. There is a good chance that Chirac’s successor will be more interested in promoting European defence and, in the case of Sarkozy, that may well be together with the United States. Certainly, he has made it clear that the question of the missile defence shield was not simply a question for Poland or the Czech Republic to face. It was one for all of Europe. Meanwhile, Mme Royal seems determined to prove France’s exceptionalism in one respect. In the past, whenever there was a serious woman candidate for a top political job in any of the developed countries, she tended to win. Then again, Mme Royal seems to conduct most of her campaign on the basis that she is a woman and everybody who opposes her does so from the standpoint of the phallocatie. In today’s interview with RTL Royal went completely over the top, warning France that if Sarkozy is voted in there will be a civil war in the country. It is my responsibility today to alert people to the risk of (his) candidature with regards to the violence and brutality that would be unleashed in the country (if he won). To me that sounds horribly like the desperate words of a loser but one can never predict in a democracy. That, presumably, is what annoys Russian politicians about western countries.